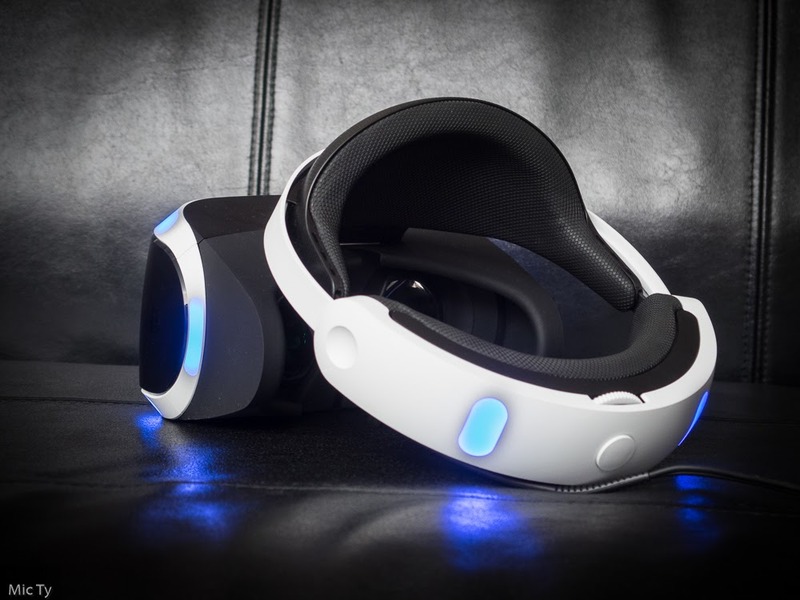 The Sony Playstation VR could be the first VR system that is truly adopted by the masses. Unlike Google Cardboard or Samsung Gear VR, it provides “full” VR with positional tracking (6 degrees of freedom). 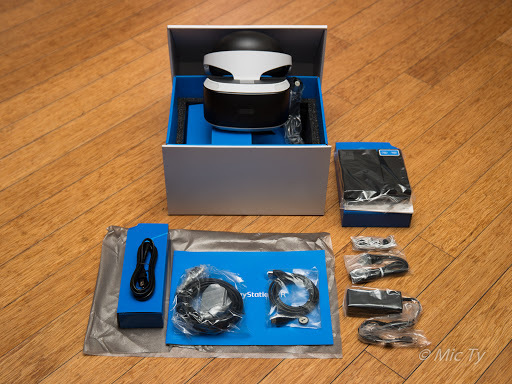 But at the same time, it is more affordable than the HTC Vive and Oculus Rift, and with over 40 million Playstation 4 owners, it has the largest number of potential users among desktop VR systems. But does it really deliver good quality VR with relatively modest hardware? Should you buy it? 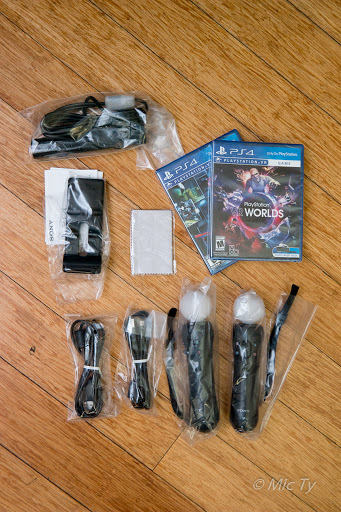 If you don’t already have the Playstation Camera and Playstation Move controllers, the Launch Bundle effectively gives you the Playstation VR Worlds game for free, compared to the total cost of getting the components separately. The headset comes is a box with strapped hinges so that it opens like a treasure chest. When you open the box, you’ll see a diagram of the setup printed on three boxes. As you remove each box, inside you’ll find the cable or adapter that corresponds to the part of the setup diagram that’s printed on the box — a very clever idea. After you remove the boxes, underneath you’ll find the headset. 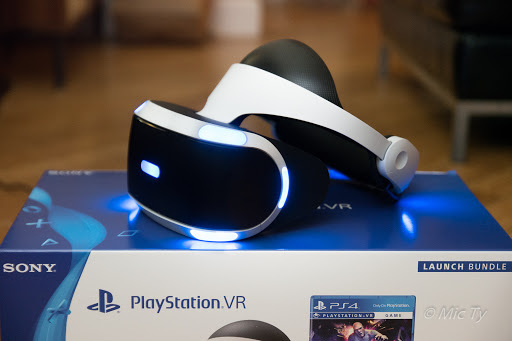 The PSVR headset looks cool and futuristic but still friendly and appealing. Besides the overall design, there are beautiful details, such as the subtle Playstation logo on the visor. It hints as to the amount of careful design that went into the headset. The headset is not something you’d wear purely for fashion’s sake but it definitely has the best aesthetics among VR headsets. Setting up the Playstation VR could look intimidating for a VR novice, with the many wires and cables, but the actual process is not complicated. PSVR consists of the i) headset, ii) camera and iii) breakout box. 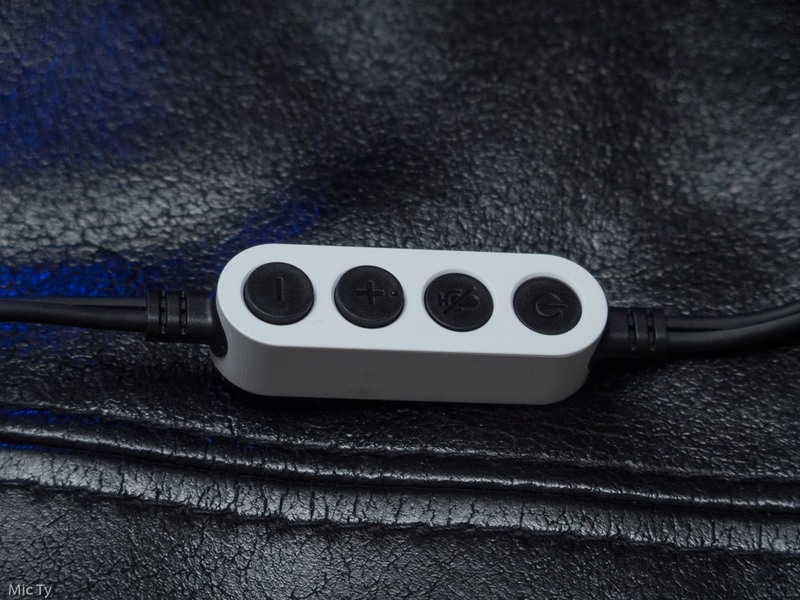 The headset connects to the front of the breakout box with a 2-in-1 cable. The headset can connect directly to the breakout box or through a supplied extension cord (recommended for most games). The headset has an in-line remote control with power button, mute and volume controls. If you want to use earbuds (included) or a headphone, you can connect it to the remote control. The camera attaches to a dedicated port on the PS4. The camera then has to be positioned either above or below the TV. I got better results with the camera above the TV, at around the level of my nose, with the camera angled down toward our couch. When you launch PSVR, it will show you the camera’s point of view so that you can aim the camera better at your sitting (or standing) position. a. Connect the box to the PS4 with a USB cable (either USB port on the PS4). b. The box needs a video connection. It goes from PS4 to the box to your TV. Transfer the HDMI cable currently connected to your PS4 to the box. Then connect an HDMI cable from the box to the PS4. There are labels at the rear of the box clearly indicating which port is to be connected to the PS4 and which one to the TV. c. The box also needs to be powered with its own AC adapter. The PSVR is the most comfortable VR headset to date. While all other VR headsets have used some type of headstrap that pulls the visor to your face, the PSVR uses a generously padded halo-like crown that suspends the visor in front of your eyes. To wear the PSVR headset, you pull apart the crown and put the padded front part above your forehead. You slip the rear part behind your head, with the crown being angled like a laurel wreath. The headset rear has a dial that you can turn to tighten the crown, and a button to release the dial. You press a button on the bottom of the visor to move it forward or backward. The visor as seen from the bottom. Note the microphone on the left, and the button for moving the visor forward or backward. Note also the embossed triangle, circle, x and square which show the positions of the attachments for the faceplate. This design has several benefits. First, the weight of the headset is evenly distributed around your entire head and over your neck. It isn’t front heavy like the HTC Vive or Gear VR. Although the PSVR has the heaviest headset (610g) in this group, it is the most well-balanced and feels the lightest. Second, it makes it very convenient to wear the headset over prescription glasses. Third, because the visor is barely touching your face, the visor doesn’t get sweaty, plus there is less tendency for the lenses to fog up. The halo does get sweat, but it is made of plastic and rubber and is easily wiped clean with antimicrobial wipes. Fourth, if you want to look around your room temporarily, you can do so easily by moving the visor forward and looking below the visor. By contrast, the Vive and Gear VR have straps that can absorb sweat and can become smelly over time. The Rift’s strap doesn’t absorb sweat, but the Rift, Vive and Gear VR’s foam facepads absorb sweat. Another advantage of the PSVR is that it doesn’t have a headband in the middle. 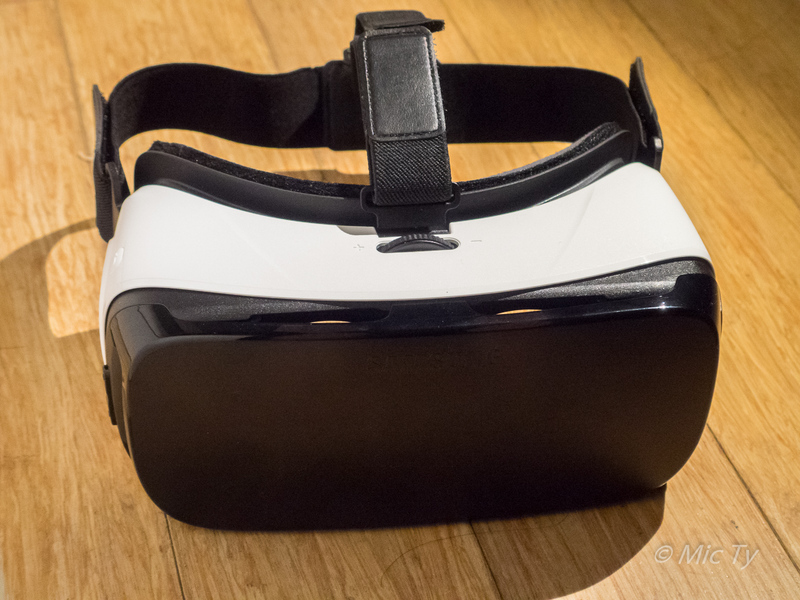 On the Gear VR, Rift and Vive, there is a middle strap that goes over your head. If you use those headsets for a while then remove them, you’ll see your hair with a flattened line down the middle. The PSVR doesn’t have a middle headstrap. On a related note, Gear VR, Rift and Vive will leave a “VR face” like a ski mask. PSVR won’t do that, but you may have a “VR forehead” with a line across your forehead. The PSVR’s visor does have a few drawbacks. First, there’s no focus adjustment. You can only move the visor closer or farther from your eyes. But the distance between the lens and the internal display is constant, unlike in the Gear VR. On the other hand, the PSVR headset readily accommodates prescription glasses. Second, for many people, the visor doesn’t completely block out ambient light. If you look down, you can see a little bit around your nose. Sony said it was deliberately designed that way so that users don’t feel as if they’re being blindfolded when the unit is not yet turned on. Third, the headset can accommodate heads as small as my 6-yo daughter’s but for people with very large heads or whose heads are not round, the headset crown can feel uncomfortable or too tight. Turning on the PSVR is pretty simple. With everything connected and the PS4 turned on, you wear the headset, then press the power button on the in-line remote on the headset cable. In the PS4’s settings for devices, there’s also an option for a more detailed setup where it will estimate your interpupillary distance (IPD), and you can recalibrate the tracking lights on the headset. However, the distance between the lenses is actually fixed and instead, the IPD setting appears only to rescale the image. The PSVR menu is simply the PS4 menu except on a virtual screen floating in a void. It’s not as fancy as Oculus’ 360-degree menu, or even the Vive’s menu (which also has a customizable 360-degree background). You launch games the same way you would any PS4 game, by selecting the icon. As the player uses the PSVR headset, other people can watch the TV, which will show the user’s perspective (called Social Screen). In some games, the Social Screen shows a third person / spectator’s view. If you’re in the middle of a game and you remove the headset, the game will usually pause automatically, and the TV will show an option to resume the game or change the VR settings. One thing that could be better is the load times. Loading any PSVR game can take a while. To be fair, the Vive can take time to load as well, but the PSVR takes noticeably longer. Noneheless, one of the PSVR’s strengths is that it is very simple and easy to pickup and play. Before we discuss the graphics, I’d like to talk about the PSVR’s optics (lens performance, etc.). Although the PSVR’s optics are not perfect, they are in my opinion the best optics among the four major VR systems. The PSVR has a circular view, similar to that of the HTC Vive, and unlike the squarish frame of the Gear VR and Rift. For many people, the circular view looks more natural. The field of view is listed at 100 degrees, less than the 110-degree view of the Vive. In the real world, it seemed the FOV was larger than the Gear VR but smaller than the Vive, although it wasn’t a huge difference. The most significant difference between the PSVR and its competitors is that you won’t see a screendoor effect (SDE). 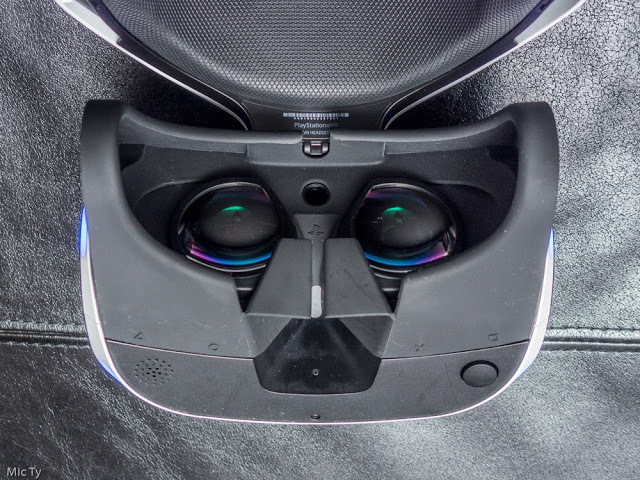 On other VR headsets, you can see the actual pixels, which makes it seem like you’re looking through a screen door, especially when looking at bright images. To some, SDE is immersion-breaking. It also makes it hard to see small details such as text. The PSVR’s display resolution is lower than that of its competitors but it uses RGB pixels instead of the pentile matrix used by other VR headsets, and if you count the subpixels, the PSVR actually has more subpixels than its competitors. I can still see the PSVR pixels, but they are much smaller and you won’t see the screendoor effect. Another major difference is that the PSVR doesn’t use Fresnel lenses (lenses with concentric rings). The Rift and Vive have Fresnel lenses. As a result, when there are bright images on a dark background, you’ll see what seem like light rays radiating from bright images (dubbed god rays because of their similarity to crepuscular rays) on the Rift, or the reflection of the concentric rings on the Vive. The PSVR and Samsung Gear VR have none of those artifacts. A third difference is with chromatic aberration, i.e., the colored fringing on images especially at the periphery of the lens. On the Rift, Vive and Gear VR (especially the 2016 edition), there is noticeable chromatic aberration, while I didn’t find any fringing for the PSVR. I also did not notice any distortion, unlike on the Oculus Rift, which has a little bit of distortion on the peripheries of the lenses. The PSVR does have some issues with optics. First, the display looks as if there is a very thin veil over them that makes the images look a little softer than the sharp images from the Gear VR, Rift and Vive. Second, blacks on the PSVR are sometimes not very deep, and have tiny speckles. This can be seen in games such as Battlezone, during the startup sequence when the tank interior is still dark and the windshield is covered. Third, for some reason, my eyes feel more strain with some games on the PSVR than on the HTC Vive or Gear VR (I haven’t used the Rift long enough to see if I have the same issue). VR is very processor-intensive, and both the Oculus Rift and HTC Vive require powerful gaming PCs with high-end VR-ready graphics cards. 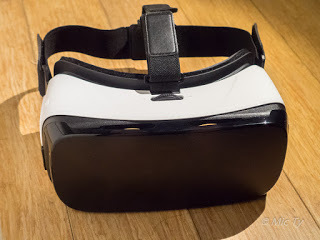 The Gear VR works with a high-end mobile processor but has much simpler graphics and doesn’t have positional tracking (6 degrees of freedom), which reduces the processing load. Even then, my Samsung S6 heats up quickly when used with the Gear VR. I wondered how the PSVR graphics would compare to those of other VR systems, especially since Sony is on record for saying that the PSVR is not as powerful as the Rift and Vive. There are some PSVR games that have simple, deliberately stylized graphics such as Battlezone (which is a Tron-like tank game) and Rez Infinite. These simpler-looking PSVR games don’t look that much different from the best-looking Gear VR games. However, there are several PSVR games that have much more detailed graphics, such as Playstation VR Worlds and Batman: Arkham VR. These PSVR games have graphics that make up for the PSVR’s lower resolution with more detailed 3D models. It is like seeing a game with detailed 3D models but downsampled to something that looks like 480p. It’s not as sharp as a 1080p video game with similarly detailed graphics, but it still looks pretty good. I would say that the character models for these games look even more detailed than anything I’ve seen so far on the Rift or Vive. Overall, the graphics on the PSVR are pretty good despite the limited hardware. At the same time, because of the PSVR’s weaker hardware compared to a gaming PC, you can see that some parts of the images have very detailed models, such as faces of people, while other parts such as the background either have less detailed models, or have fewer objects. The Playstation VR uses a six-axis motion sensor (three axis gyroscope + three axis accelerometer) and a Playstation Camera which tracks the 9 LED lights on the headset (7 in front plus 2 at the back). Remarkably, the headset tracking works reasonably well even though it uses the Playstation Camera, which was never designed for VR tracking. Sony boasts an 18ms lag (less than the 20ms maximum lag for smooth VR) and a refresh rate of 90 or 120 hertz (60 fps reprojected to 120 fps). In the real world, I generally found the headset tracking to be smooth and accurate, with no noticeable lag. And yes, you do get true positional tracking with 6 degrees of freedom. However, this isn’t to say that the PSVR’s tracking is as good as that of the Vive or Rift. The PSVR’s headset tracking has several limitations. First, the tracking area for the PSVR is limited compared to the Rift, much less the Vive. If you take around two steps in any direction, you’ll lose tracking. You’ll know because the screen will darken and if you keep going further it will say “Out of Play Area.” You can see the limited area of the Playstation Camera’s view at that screen where you’re asked to check if your surroundings are clear. Another issue is that the PSVR’s headset tracking can drift. After playing for a while, you may find that your view is no longer centered. Fortunately, on most games, you can re-center the headset by holding down the Option button for about two seconds. Alternatively, you can re-center the headset by removing it and then changing the VR setting on the TV screen. The PSVR’s tracking also seems less accurate on the z-axis (toward and away from the TV). When you move forward and backward, sometimes you’ll notice near objects moving slightly in and out of position. This can be a little nauseating for me. By comparison, the Vive’s tracking is very accurate on all axes. Another limitation is that if you accidentally cover the LED lights on the headset or if someone passes in front of the camera, the tracking will be compromised, and the virtual world might sway a bit, which can be nauseating. Finally, on some games that use the headset as a controller (e.g. Headmaster, where you head soccer balls), the collision detection felt a little bit off, like the ball would bounce off your virtual head a little bit before you expect. I think the issue may be that the game used a virtual model of the PSVR headset which of course protrudes a bit from the user’s face. While the PSVR headset tracking works well, the controller tracking isn’t nearly as good. 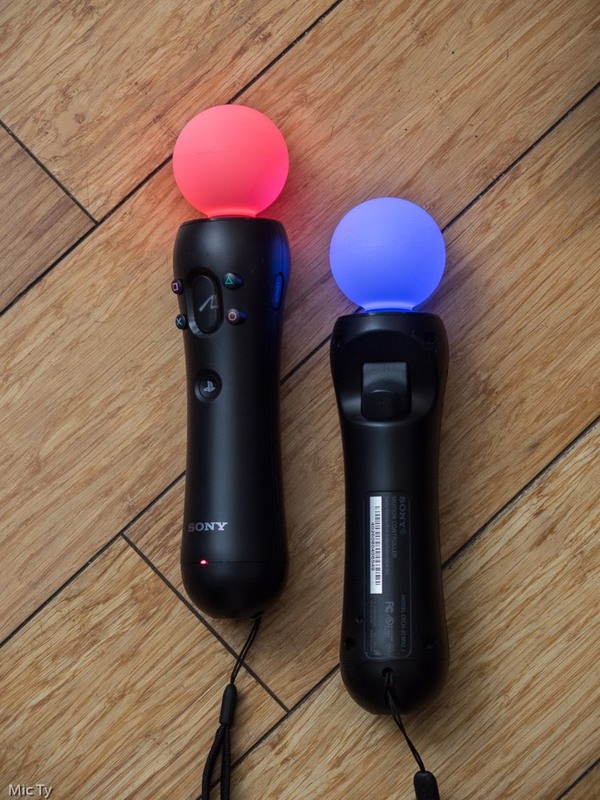 The Playstation VR uses either the DualShock 4 (DS4) or the PS3-era Playstation Move motion controllers. The camera tracks the LED light on the DS4 or Move controllers, which also have motion sensors. However, perhaps because they each have only one LED light, the tracking is not as accurate. Even when the controls are stationary, the virtual representations of the controls tend to jitter or drift a bit. 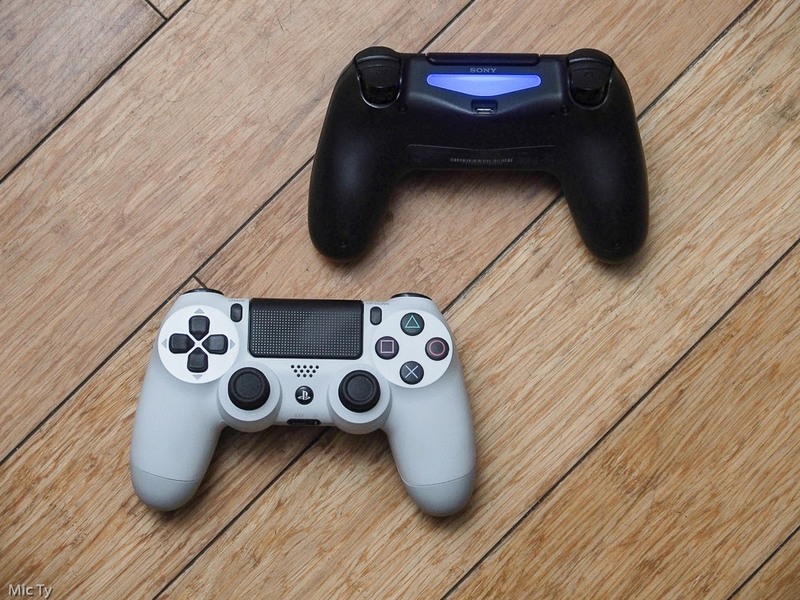 The position of the virtual controllers also usually isn’t very accurate compared to the real world position of the controllers. In my experience, the DS4 tracking seems even more problematic. In addition to the same problems as the PS Move, the virtual DS4 also tends to face the wrong angle after a while. As with the headset, you can re-center the controls by holding down the Option button. Another issue is that you can turn around in 360 and face backwards with the headset, but the controllers will be occluded. When the controllers are occluded, the controller tracking becomes inaccurate. So, you can face backward only with games that don’t use controllers, such as the Ocean Descent demo in Playstation VR Worlds, or as long as you keep the controllers within the camera’s view. Despite the limitations of the controllers, they generally do work. When I was playing London Heist, I could aim the gun and it would shoot where I expected it to. The controller tracking didn’t interfere with the gameplay, and I didn’t have any problems getting headshots, for example. And the motion controllers did improve immersion, by allowing me to interact with virtual objects more naturally than with the DS4. But it’s easy to move the controller out of the tracking area by moving it too high or too low. I also wish that the PS Move controllers had some kind of joystick or trackpad (like the Vive controllers or Oculus Touch). One benefit of consoles is that the hardware is uniform, plus there’s tighter quality control by Sony. As a result, graphics run smoothly on all PSVR games and demos I’ve tried so far. No skipped frames, jitters or anything. On the Vive, I have experienced skipped frames or jittering on some games or apps (such as Gnomes and Goblins), despite my PC being rated as “High” on the Vive VR-Readiness Test. Immersion is subjective, so it’s hard to determine it conclusively. I would say the sense of presence wasn’t as strong compared to the Oculus Rift or HTC Vive because of the limited tracking area. In the Rift and even more so on the Vive, I could walk around the virtual space, which makes them feel more real. Nonetheless, in my experience, despite the lower resolution and tracking limitations, the PSVR did provide a sense of immersion and presence (feeling as though you’re at the virtual location), most noticeably for standing experiences such as Ocean’s Descent (in Playstation Worlds). Even some seated games felt immersive. For example, in Until Dawn: Rush of Blood, after a couple of minutes, it did feel like I was riding on a horror ride in an amusement park. Here are more example quotes. 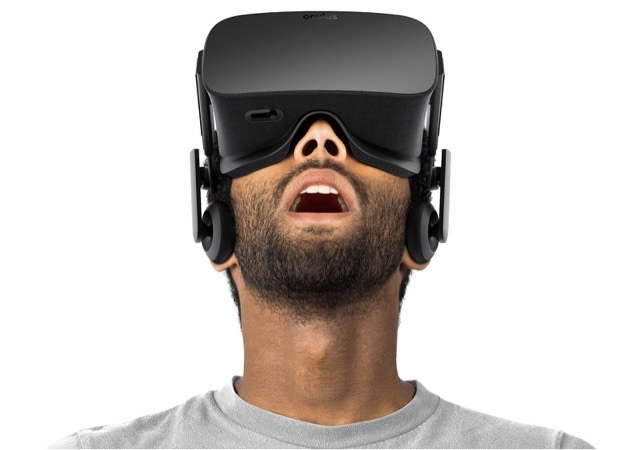 VR headsets with positional tracking are less nauseating. However, there were some games I tried where I felt nauseated, and unlike Oculus Home, the Playstation store does not assess the likeliness of nausea. I’ve felt nausea from games such Eve: Valkyrie (not Eve: Gunjack) and Driveclub VR. Lastly, because the tracking on the z axis isn’t totally accurate, I sometimes feel discomfort if I move my head back and forth more than a few times. Unfortunately, PSVR’s store doesn’t offer ratings for discomfort. But some users reported being able to get a refund on games when they reported experiencing nausea (unlike the Oculus store). It would be best to try a demo. In my view, perhaps the greatest strength of the Playstation VR is the quality of its games. Games for the PSVR generally seem much more polished than the Vive, and even more polished than those on the Rift or Gear VR. The PSVR also includes a demo disc, which showcased a wide variety of PSVR games. Besides the usual shooters like Battlezone and Eve: Valkyrie, there were innovative games such as Wayward Sky, which utilizes a hybrid locomotion technique that uses the third person perspective for locomotion and a first person view for interaction. Harmonix Music VR’s demo has minigames that include an app similar to Tiltbrush, and another app where you can use the motion controllers to choreograph the dance movements of some characters. 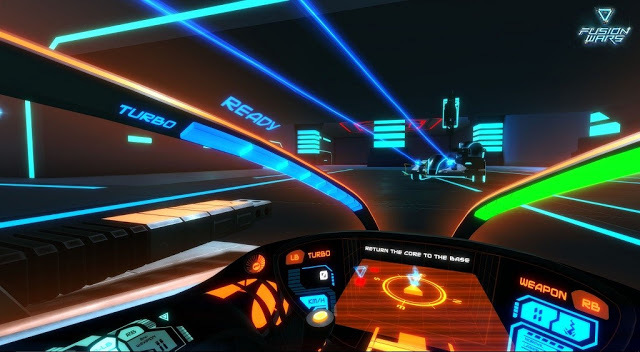 The free downloadable game Playroom VR also showcases asymmetric gameplay, where the VR user cooperates or competes with other players who use the TV screen. Here is a list of games for the PSVR, both exclusive and otherwise. 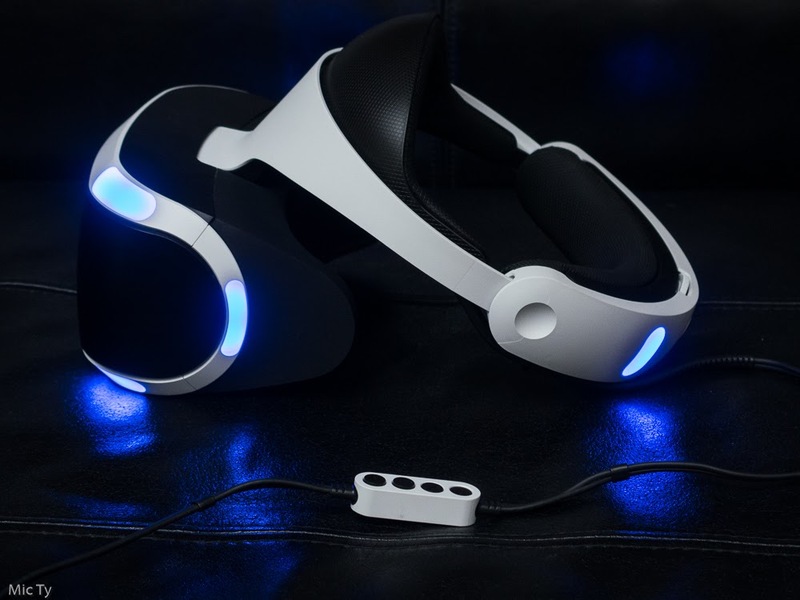 Besides games, PSVR can be used to view 360 photos and videos (in standard equirectangular format) stored on a USB thumbdrive, using the version 2.5 of the Media Player app. However, 3D photos and videos are not yet supported on the app. There are also apps for viewing 360 videos such as Within (formerly Vrse), Littlstar, Vrideo, and Hulu VR. The PSVR can also be used to play any non-VR games or apps in a giant virtual screen, called Cinematic Mode. In this mode, you’ll see a large virtual screen in a virtual space. The size of the screen can be adjusted from small, medium and large. In the small size, the screen stays centered in your view regardless of which direction you turn. In the other modes, the screen stays in the same virtual location, independent from your head movement. The PSVR can also view any HDMI source in Cinematic Mode. You simply connect the HDMI source to the rear of the breakout box that would otherwise be connected to the PS4’s HDMI. You’ll see the HDMI source in a virtual screen, as you would with the regular Cinematic Mode. PSVR can also utilize the PS4’s built-in sharing functions for screenshots, screen recording, and livestreaming with the Social Screen (the view shown on the TV). 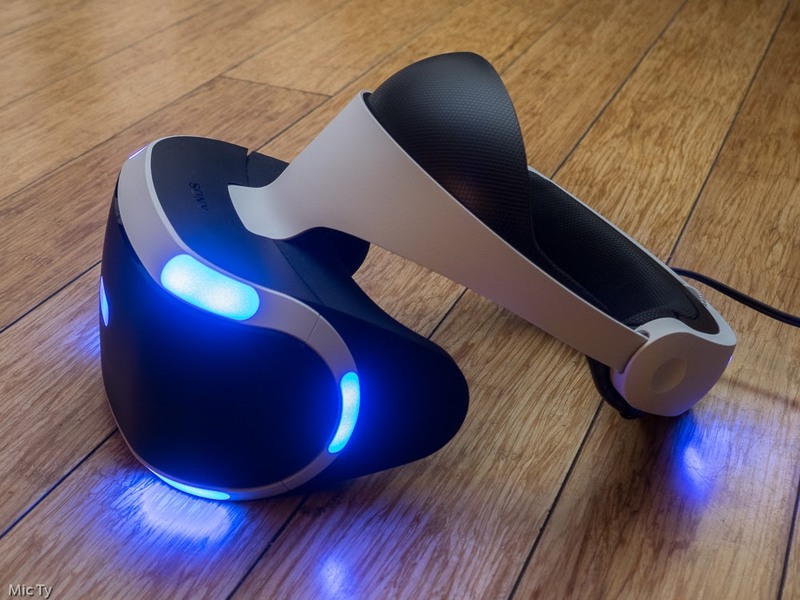 There is a huge difference between the Playstation VR and the HTC Vive (reviewed here). Besides the difference in graphical power, the HTC Vive has best-in-class tracking of the headset and controllers. The Vive tracks the headset and controllers with nearly perfect accuracy and no noticeable lag, in almost any position. Unlike the PSVR which is very sensitive to people passing in front of the camera, the Vive’s headset has 37 sensors, and relies on 2 base stations constantly sweeping your play area with invisible lasers, which makes it nearly impossible to block the headset tracking unless you try really hard. One game that is available for both PSVR and the Vive is Job Simulator, where you perform job tasks in a virtual environment, such as cooking or fixing a car engine. On the Vive, you can do pretty much anything you want without any issues, and there’s some space to walk around (assuming your play area has adequate space). On the PSVR, Job Simulator uses a smaller space to keep the player within the limited tracking area. There are also tasks that require you to face almost backward, where the PSVR controller tracking becomes less accurate. You also can’t crouch too low or else you’ll be outside of the tracking area. Finally, in my case, I found that the PSVR headset tracking doesn’t work perfectly on the z-axis, so the virtual world moves a bit when I move forward or backward, which I find a little nauseating. I felt no such discomfort on Job Simulator for the Vive. Many Vive games also have support for roomscale, allowing you to walk around your play area (up to about 13 feet by 13 feet). 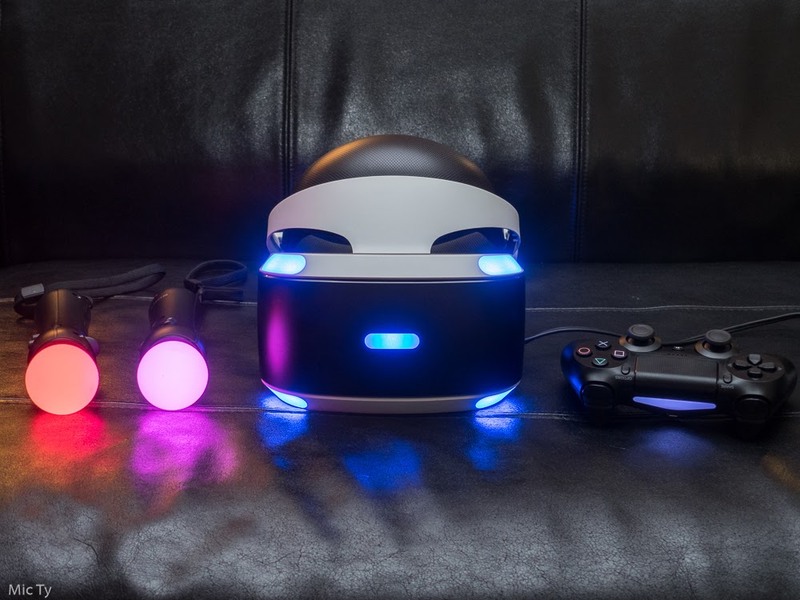 PSVR games are limited to standing or seated experiences. On the other hand, PSVR does have several advantages over the Vive. It costs much less ($500 vs. $800) and the required hardware also costs significantly less (under $300 vs. at least $600). The PSVR’s games are also generally much more polished than the vast majority of Vive games, many of which are indie games developed by only one person, over a relatively short period of time. Even polished games on the Vive such as Valve’s the Lab are less detailed than some of the games for the PSVR. The contrast between PSVR and Oculus Rift (impressions here) is not as stark. Both systems have games that are primarily seated or standing. Both have a walled garden approach which focuses on quality, and tries to secure exclusives. I would say the difference between PSVR and Rift is more of a matter of degree: the Rift has a sharper display and better tracking. The Rift will also soon have the best-in-class Oculus Touch motion controllers which is capable of finger tracking to some extent. Again, the PSVR’s main advantages are its cost and its games. The Rift costs $600 without motion controllers, and $800 with motion controllers. If you want to add a third sensor for roomscale tracking, that will be another $80. As for the required PC, Oculus now allows hardware with slightly lower specs than what’s required for the Vive, but it’s still more expensive than a PS4 (under $300 vs. at least $500). As for games, the Rift’s games are generally more polished than those of the Vive, but the PSVR’s games are still more polished, in my opinion. When I first tried the PSVR, I played Battlezone, which I felt was similar to some games on the Samsung Gear VR (reviewed here). After having used the PSVR for a couple of weeks, I would say the PSVR is more similar to the Oculus Rift than the Gear VR. Some of the best-looking Gear VR games can look similar to some of the simpler PSVR games but generally, most PSVR games look significantly better. No this is not the PSVR’s Battlezone. It’s Fusion Wars, an upcoming game for the Gear VR. In terms of tracking, the PSVR and Gear VR both have excellent head rotation tracking but the PSVR’s positional tracking puts it in a different league from the Gear VR, and the PSVR provides a stronger sense of presence. On the other hand, the Gear VR is generally cheaper than the PSVR. If you already have a smartphone compatible with the Gear VR, the Gear VR is only $99. If you don’t have a compatible smartphone, that will cost you at least $250 for a used (and potentially damaged) smartphone. Gear VR games also tend to cost less, at around $5 to 15, but they tend to be much simpler than the games for the PSVR. Occasionally, some users encounter issues with the PSVR’s tracking. In many cases, the tracking issues are caused by reflections from seemingly innocuous sources such as a white wall or a TV behind the user. Occasionally, the PSVR tracking will also go haywire. On one occasion, the display would move left or right as I was moving forward or backward. When the tracking used to work well but starts behaving strangely, try a hard reboot of the PS4 (power off, not just rest mode). 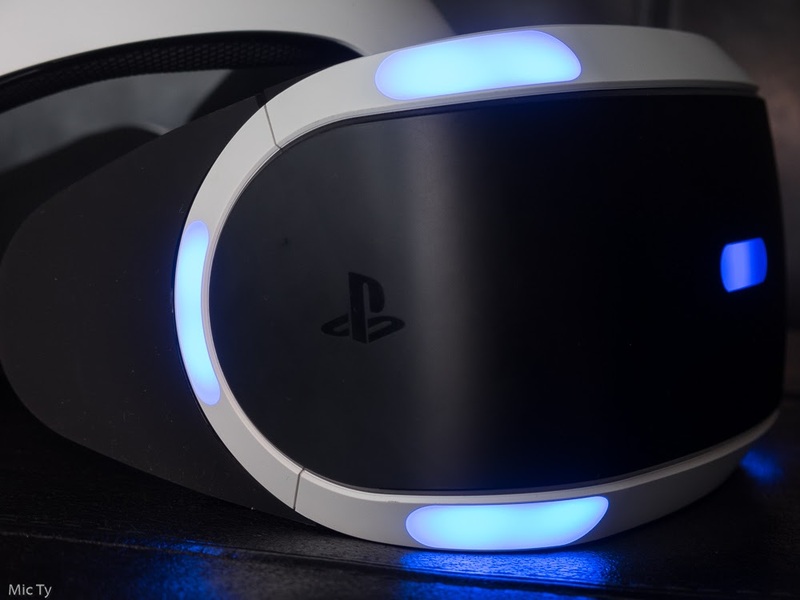 The Playstation VR has several limitations but does deliver a true VR experience with six degrees of freedom, and does it for a significantly lower cost than the HTC Vive or Oculus Rift. Regardless of cost, it may also have the best available VR games. It is a solid system for desktop VR, either by itself or as a complement to your existing VR system.